If you are thinking about buying a swivel jaw vise without the pin, or one that is damaged beyond repair, it really shouldn’t be a deal killer. Swivel jaw vises use a pin that is tapered, and the pin should fit tightly and not wiggle or rock. If the pin is kept clean, oiled and taken out every now and then, you will never have a problem. That said, removing these pins after years of not being used is some times difficult! 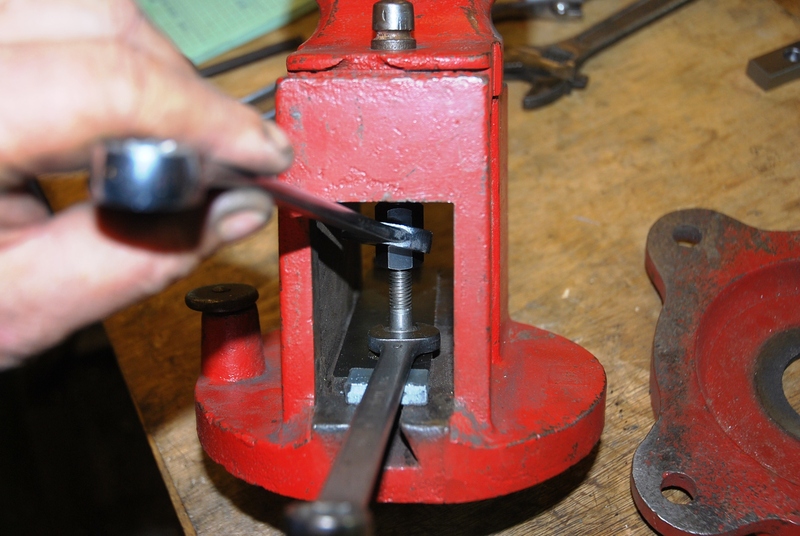 Hard to see the swivel pin all smashed in this 7″ Prentiss Vise. I have had several that were really stuck, and making a Jack Screw is a great starting point. I use a coupling nut with two bolts which is as good as a simple compact jack screw. Next, be sure to have a steel plate underneath the jack screw so you will not damage the cast dovetail that locates the nut. The tapered pin hole in the swivel jaw and the static support has a through hole so you can get to it underneath inside the square slide area. The 7 inch Prentiss I show in my top picture will most likely have to be drilled out and removed with a slide hammer. I just know it. I’ll add a picture when I get to this repair. I will be using plenty of heat from my oxygen and acetylene torch. When using heat, be sure to heat around the pin. I like having the flame pointing away from the stuck pin, and on the mass around the pin. If you heat the actual pin, it will expand the same as the casting. 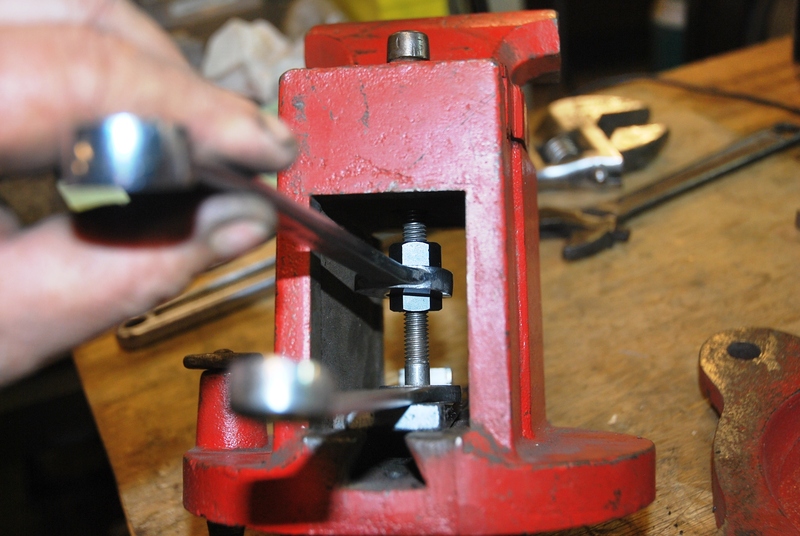 You want the steel around the pin to expand and break the rust seal holding the pin. keep pressure underneath with the jack screw and eventually she will pop. You don’t have much time heating though, because the pin will inevitably warm up too. Doing this a couple of times will work. This way works too if you are replacing the pin with a new one. I tapped the pin with the largest thread I could get away with and built a puller setup like in the picture. Using the square slider as a support for the setup is a safe idea. I kept heat on the pin area and eventually it popped. 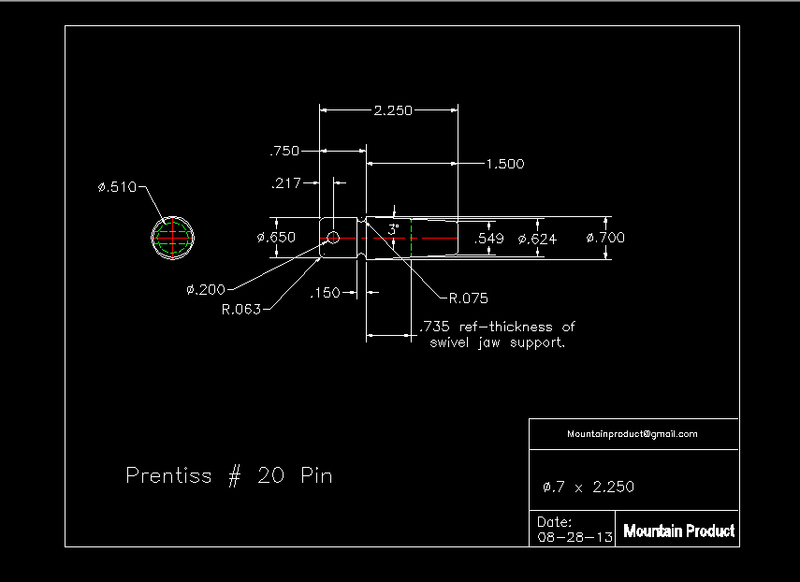 The Prentiss pins are made to 3 degrees per side, 6 degrees for the included angle. 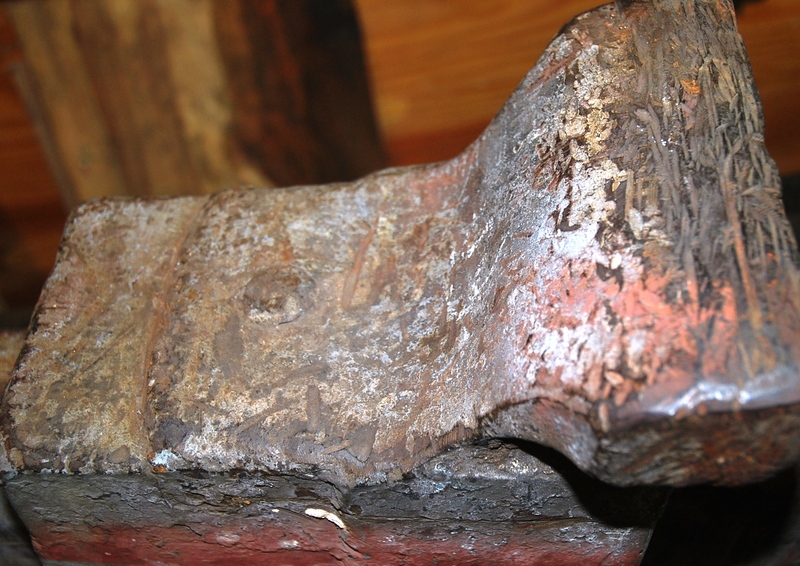 You might need to measure a old pin or vise to figure what angle the pin is that they used. Some have suggested cutting a thin shim and hand file the angle till there is no gap. Then use it to set the angle on your lathe or angle grinder. I prefer to measure the major diameter then the minor diameter subtract the two and divide the sum for the triangle end. Then measure the length of jaw support for the other leg of the triangle. Use simple trig (TOA) Tangent = opposite over adjacent then atan the sum for your angle. 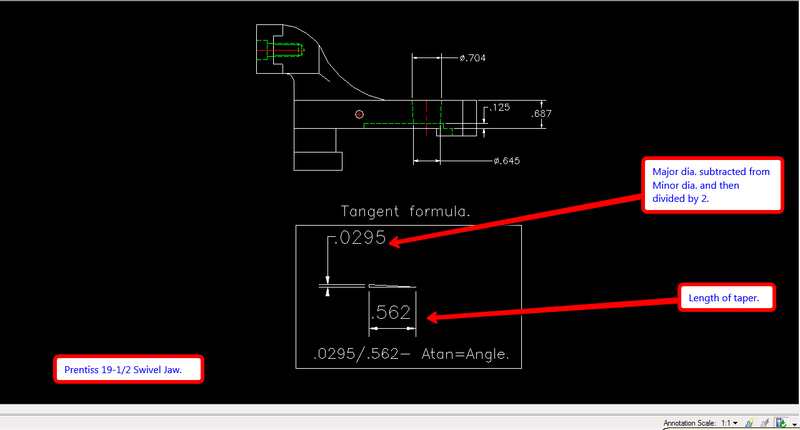 Some just duplicate the geometry on a CAD system to figure the angle like what I do. This drawing is a cut away view of a Prentiss 19-1/2 Swivel jaw. I added the triangle for this example. Making the pins can be done in a couple ways. I like spinning the pin in a surface grinder on a sine plate with a spin fixture. The ground surface is a clean way to make angle pins. 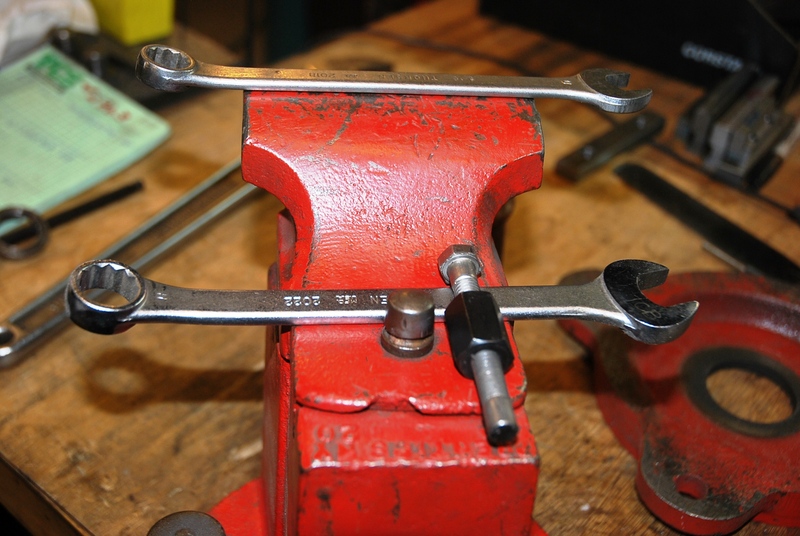 If you have a lathe, then it is an easy angle adjustment on your compound. You can be creative on the knob end. Make it a full ball, or what ever shape you want. I like adding a 3/16 hole through the side in case it ever gets stuck. 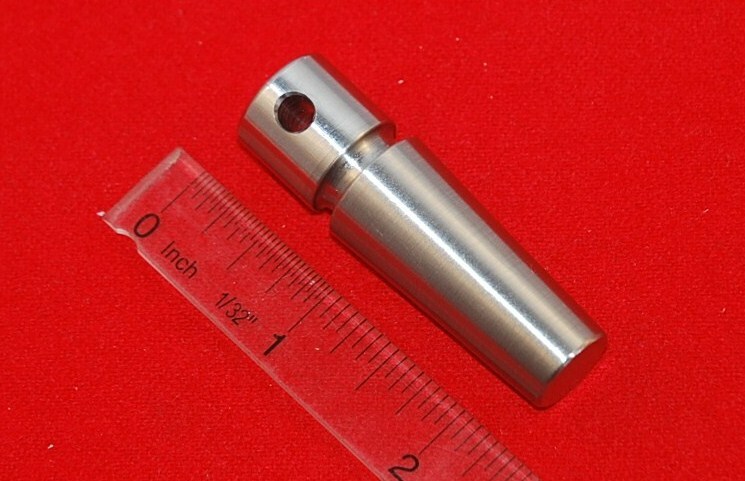 I also like to build the pin out of 303 SS so it will not rust. Stainless Steel is a soft metal but will hold up fine under clamp pressure.